Win VIP tickets to the Spring Knitting and Stitching Show! You’ll get entry to the show on one day of your choice, a free gift, seating in the VIP area, use of the VIP cloakroom, a show guide, £1 off workshops, and discounts from selected exhibitors. Say 'hello' to spring with the latest issue of Inside Crochet. A lovely decoration from issue 109. Keep your smart device safe. Win all the Stylecraft yarn needed to make Sarah Shrimpton's Folklore CAL Blanket! 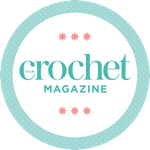 Get 3 back issues of Inside Crochet for the price of 2! Add to your Inside Crochet stash.